Kitchen Conservatory offers more than 850 different cooking classes every year. These fun cooking classes are taught by the talented chefs and fabulous culinary educators who share their specialties of the kitchen. 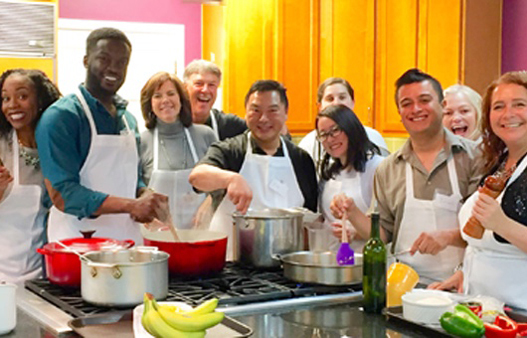 We offer both fully-participatory classes and demonstration classes that feature a wide variety of menus and themes from beginner to gourmet to ethnic cooking. All cooking classes are held at 8021 Clayton Road. Spend an exotic evening dining on the rich and vibrant flavors of Turkish cuisine. Enjoy roasted garlic hummus and baba ghanoush on homemade pita, roasted red bell pepper soup, cucumber salad with yogurt and mint and raisins, braised chicken with walnuts and pomegranate seeds on couscous, plus date-walnut-chocolate meringue dacquoise. Join Margi Kahn to discover a paleolithic hunter-gatherer approach to cooking, combined with a gluten-free menu. This hands-on class will create an exciting meal with cocktail meatballs with curry dipping sauce, roasted salmon with citrus-ginger glaze, sweet potato-orange purée, Brussels sprouts hash, plus French profiteroles. Looking for the perfect gift? We have just what you're looking for! Gift Certificates may be redeemed for cooking classes or merchandise. They may be used online or in the store. They expire after one year. Gift certificates can be printed from your own computer or mailed to any address. Let us help make your next party great! The best parties happen in the kitchen! Forget the hassle of entertaining at home or shouting over others at a noisy restaurant. Host your next shower, birthday party, Customize a Cooking Class Just For Your Group at Kitchen Conservatory: St. Louis MO corporate team-bonding event, office party, dinner club, or any other event in one of our lovely and fun kitchens. We will provide a fabulous 3 or 4 course dinner that is sure to be memorable. Plan the menu with one of our talented Kitchen Conservatory chefs and choose any recipe you desire. Your menu is exactly what you want to eat. Tailor a program and menu that's perfect for you and your guests. I'm Ready to Get Cooking! Kitchen Conservatory is the premier kitchen store in St. Louis, Missouri. For 35 years, Kitchen Conservatory has offered the finest tools for the kitchen and delectable cooking classes at our Clayton store. Locally-owned and very independent, we offer all the tools and knowledge for the ultimate kitchen experience. Please browse our fabulous selection of more than 6,000 essential and useful cooking products or shop online. Email Ask the Chef to solve your cooking dilemmas!